Trailer - Teen Devotionals... for Girls! 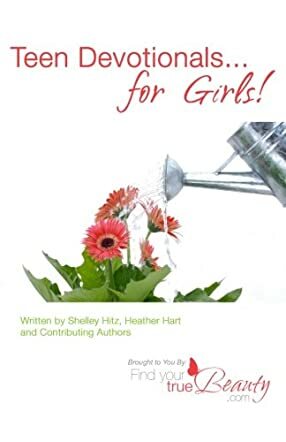 Shelley Hitz has been writing and publishing books since 2008. She is also the author of the website, FindYourTrueBeauty.com, that reaches thousands of girls each month around the world. Her openness and vulnerability as she shares her own story of hope and healing will inspire and encourage you. Shelley’s main passion is to share God’s truth and the freedom in Christ she has found with others. She has been ministering to teens since 1998 alongside her husband, CJ. Heather Hart is first and foremost a servant of Christ - but she is also an internationally best-selling author, book lover, and mother of four who is married to the man of her dreams. She is passionate about sharing the love of Christ through the written word. One way she does this is by writing devotions for teens girls for the website, FindYourTrueBeauty.com, and, in 2013, together with her husband, Paul, she founded their brother website for teen guys, FindYourTrueStrength.com. "Teen Devotionals . . . for Girls" is to help young girls find a way to apply God’s Words to their lives. These devotions are written just for young girls, with topics that deal with what teenagers are facing today. The desire of the authors is to help teens find their true beauty in Christ. This book captured my attention when I read the very first devotion, 'Beautiful in Christ', talking about inner and outer beauty, bringing the attention of teenagers to this valuable lesson. Other devotions are on prayer, modesty, goals, anger, love, lies, work, heaven and hell, decisions, waiting, the golden rule, being happy and so many more. In fact, there are 90 devotions in this really cool book. As I read through these devotions, my appreciation grew for these authors who took so much time to write this much needed book for teenage girls. With the peer pressure that teens face today, I love finding books that they can read and enjoy, helping their walk with the Lord. If you have teenage girls, this devotional is a must for you. This book can also be used for individual Bible study or small group study. After each devotion, there is a Reflection time question, an Application step and a model prayer, giving plenty of questions and topics to think about. I strongly encourage you to pick up a copy of "Teen Devotionals . . . for Girls" for your teenager. I think you will be glad you did, and your daughter will thank you as well. This is a book I will purchase for my tween niece because she keeps asking me for books she can read. I am so glad I found one just for her!